For some of us, owning a stand up paddle board is the dream coming true but for others that dream is a little bigger. Quite literally, a big SUP is the sacred heaven for a lot of paddlers because it has so much more to offer. Undeniably, giant paddle boards are high maintenance but that’s a price a lot of paddlers are willing to pay. Nevertheless, a big SUP is easily not for everyone and that begs the question: who enjoys a giant paddle board? Believe it or not, there is a wide spectrum of individual paddlers who truly appreciate longer and steadier rides. 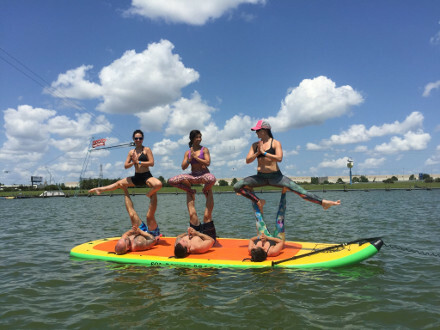 However, big SUP boards are often considered party boards because they are capable of handling multiple riders at the same time and make a fantastic diving platform. 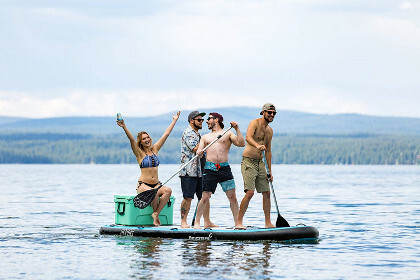 So, whether you’re an adventure / tour lover or a beach crasher, you are going to appreciate this article because we did the research and filtered out what could be the 8 best Giant inflatable paddle boards ever. A peak board on this list was almost intuitive as it is a brand of many top notch inflatable stand up paddle boards. Indeed, Peak excelled significantly in the industry due to its wide variety of sizes and shapes. Thus, the Peak Titan is truly an example of what a giant sup board should look and feel like and with all those little defining features and specs, you are guaranteed to think twice before crossing it out. First things first, the Titan is 12 feet long which is easily the length of 2 people combined and that is scary big. Accordingly, a board this long is going to be much steadier and slower in manoeuver, which is great for long touring. Further, the Titan comes at 45 inches in width to balance out the significant length, consequently granting you and perhaps your co-paddlers enough room to move around at ease. Finally, in thickness, this Peak comes at a staggering 8 inches, making it easily one of the thickest boards on the market. Indeed, any huge inflatable stand up paddle board requires a certain thickness to keep afloat but most importantly to handle more weight / cargo. Quality is a category to cruise through when you speak of a Pioneer like Peak because they make all of their boards using military grade dual layer PVC and that is almost indestructible. However, this board’s feature deserve a longer pause to admire. Accordingly, this monster iSUP board is features rich but the biggest one has got to be the huge anti-skid pad which will keep you and your companions from slipping and falling in every 2 seconds. Further, another prominent feature is the useful tie-down system that consists of 6 D-rings connected via a bungee cord making a great cargo net for holding cargo. Lastly, the multitude of carry handles located all over the edges and center of this board deserve a shout out for making the transportation process doable. ISLE is easily one of the biggest brands in the industry of inflatable paddle boards and that comes with a lot of responsibility. Indeed, in order to remain a significant brand, you must cater for every paddler out there and that includes really big sup boards. Hence, the ISLE Megalodon comes in 2 different sizes. There’s the a 15 feet long version which is capable of handling up to 7 people and a 12 feet long version with enough room for 3 people. In terms of width, it is important to note that the former comes in at 56 inches while the 12 feet long comes at 45 inches and both are impressively stable. To wrap things up, both boards a designed to be 8 inches in thickness in order to handle all the weight / cargo without getting submerged. When talking about a huge inflatable SUP board, you would imagine that quality requires some effort. Hence, in order to prepare this board to handle the partying and excessive weight, ISLE coated it in military grade PVC, making it impossible to dent or damage. As far as features go, this large stand up paddle board is covered in little nuggets. Like the Peak, the ISLE Megalodon features a gigantic gripping pad that will keep you glued to the surface of the board continuously. Also, in order to keep your belongings from floating away, the board comes with an 8-ring cargo net. Finally, it must be noted that the 12 feet board will require only 1 individual to handle whereas the 15 feet version requires 2 people. However, with all the carry handles spreading over the platform, the transportation task becomes much more feasible. Driftsun is definitely not the best large inflatable paddle board manufacturer out there but it still ranked 3rd on this list for a reason. 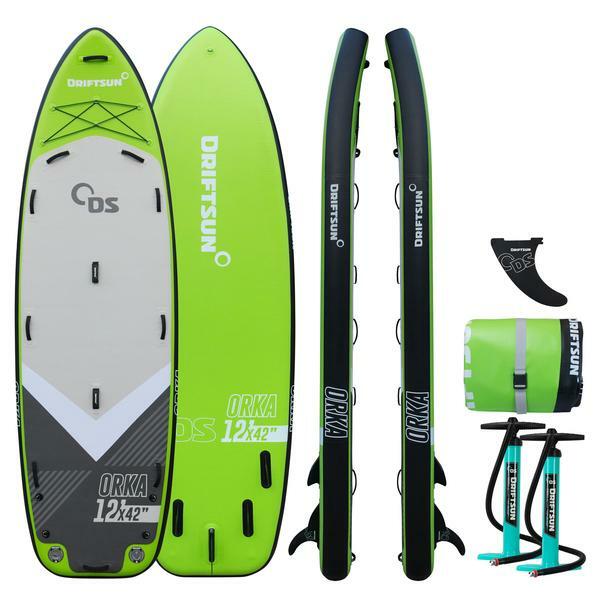 Indeed, this board is a promising competitor in this category because it offers great value for multiple paddlers for a significantly lower budget. In order to make a solid competitor, you must meet certain measurements and Driftsun plows through them like the Titanic minus the iceberg. Actually, this iSUP board actually comes at 15 feet in length which is enough room for 5 people, making it great for beach parties and those of you who really need that much company. Also, in order to keep up with that length, the board comes at 55 inches in width and that will keep all passengers stable and at ease. Last but not least, the Driftsun establishes high ground with 8 inches in thickness and that will keep you from submerging the board quickly. We cannot talk about a board without speaking of quality and to put it briefly, the Driftsun is surprisingly excellent. Indeed, the board at hand is made of military grade PVC, using MLS drop stitch construction, which renders this board virtually impossible to damage. Certainly, the Driftsun is a big sup and that gives it a lot of room to load with useful features. Hence, the first thing that catches our eye when looking at this board is the the expressive anti-skid pad that covers most of its gigantic platform which will keep you and your guests from falling over. Also, it is almost unreal to see a board with 4 fins let alone 5. Nonetheless, that’ll prove to be just enough fins to sail this giant paddle board. Lastly, carrying this board around once inflated would have been impossible without the multitude of carry handles spreading all over its surface and that’s something you’ll learn to appreciate in the long run. Sometimes, we are still surprised by how fast some new brands make it to the spot light but then we learn more about them and that explains everything. Hence, a great example of an upcoming brand is Elkton, which is a young manufacturer in the industry that can compete with seasoned brands. 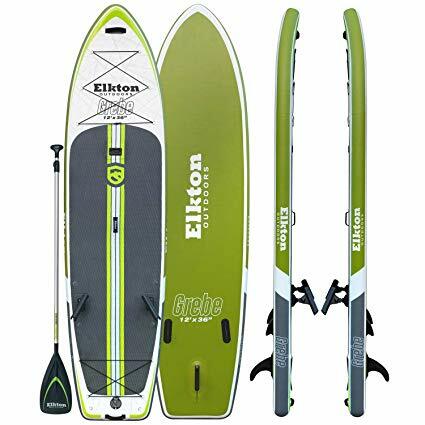 Accordingly, Elkton outdoors Grebe paddle board is definitely big enough for this list as it measures 12 feet in length, clearing enough room for up to 3 passengers. Further, to balance it out, the board at hand comes at 36 inches in width, granting you plenty of room to move around as you go. Lastly, the board measures 6 inches in thickness, which could have been better, taking into consideration the fact that it will usually host more than one passengers. However, that doesn’t come as a surprise knowing that the maximum capacity of this tremendous sup is only 290 lbs. Load capacity is rather weak on the Elkton but build quality is definitely top notch. Indeed, quality is key when it comes to inflatable paddle boards boards and Elkton is really aware of that, explaining the 15 cm drop stitch on a double layered PVC coat. Accordingly, there is no doubt that this is one of the toughest boards on this list and that brings the Elkton back to speed. Features is definitely where the Elkton excels, showcasing nice little additions that aren’t found elsewhere. However, this board would still highlight some of the necessary features such as a soft anti-slip pad, covering almost the entirety of the surface. And in order to make sure your belongings are secured and safe, the Elkton features a 6 rings cargo net. Last but definitely not least, one of the best features to find on any giant paddle board is the rod holders, making it the best fishing platform. Red Paddle Co Ride XL is great in many ways and that’s because of an impressive record, combining quality, performance and reliability in one package. Hence, the Red Paddle Co Ride XL is the outcome of a natural process for Red Paddle Co which is delivering variety. So, let’s take a closer look at this board and find out why does it come with such a potent reputation. First things first, the iSUP board at hand might be the biggest board we’ve ever landed eye on as it measures a humongous 17 feet in length. Thus, you can pretty much argue that this board might just be plenty for a party of 5. Due to its extensive length, balance would have been a huge issue if not for the board’s 60 inches wide platform, enabling all passengers to remain on deck at ease. Quality has become the trademark of Red Paddle Co since they adopted MSL fusion which is a building technique that entails a meticulous build process. So, to ensure a long lasting experience, Red Paddle Co coats the thread structure all around with a special adhesive meant to seal the seams and create a bonding layer for a high density structural PVC coat. Thus, to make sure that this process goes with no error, Red Paddle Co removed the human factor from this equation, allowing machines to create the perfect board that will last for many years to come. In terms of features, you would expect plenty from a giant inflatable paddle board like the Red Paddle Co Ride XL and that’s okay. However, Red Paddle Co SUP boards have been known for being the cleanest in the industry and that means minimalistic details that preserve the authenticity of the board. Nonetheless, this really board features a nice extensive gripping pad to keep you and your passengers in control. Also, the board features 8 carry handles which are equally necessary to transport this board around once it’s fully inflated. Finally, to wrap things up, the Red Paddle Co Ride XL features a 4-ring cargo net to keep your belongings with you at all times. Driftsun might not be the most familiar name on this list but it is still a highly competitive brand as it presents quality products for interesting prices. Indeed, in order to get ahead in the game, Driftsun puts on quite a show but is that enough to compel you to invest in it? 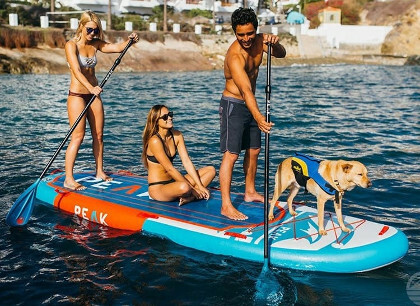 Size obviously matters which is why the Driftsun Orka comes at a staggering 12 feet in length, making it perfectly fit to compete for the title of best giant stand up paddle board. Also, in order to sustain stability, the board at hand comes at 45 inches in width, giving you and your company enough room to move around and adjust accordingly. In the end, this Driftsun does not make the mistake of affordable boards by sacrificing thickness and sticks to 8 inches, being the best ratio for its size. Quality wise, this Orka might not be on the level of a Red Paddle Co board but it definitely is high enough to make you think twice before scrolling through. Indeed, this board is rigid as it is made out of military grade PVC, MSL and drop stitching technology, which is similar to that of Red Paddle Co iSUP boards. Hence, you can expect this board to endure the toughest experiences especially knowing that it can handle up to 550 pounds. In terms of features, Driftsun wraps the deal up as it truly comes with everything you will need to enjoy your journey alone or with a group of people. Accordingly, to grant the passengers the necessary grip, the board features an extending anti-skid pad that covers most of the platform. Also, carrying this sup board wouldn’t be doable without the significant number of featured carry hands. Lastly, in order to ensure that you don’t take forever to inflate this board, Driftsun actually comes with two inflation valves and two pumps for maximum efficiency. Speaking of a multi-person paddle boards, say hello to the mighty Airhead Super SUP 1860. Airhead has been the brand of achievements since its early beginnings but this must be its biggest so far. Indeed, the Super SUP is in fact huge and that makes it perhaps the best party sup out there. 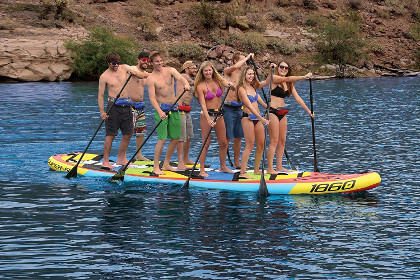 Truly, the Airhead Super SUP 1860 is big enough for 5 to 7 passengers, which does not come as a surprise knowing it actually measures 18 feet and 6 inches in length. With such length, Airhead had to push the envelop on width as well, reaching for 60 inches on this board. Hence, due to the extra wide platform, stability is enhanced significantly, making it your least concern once on the board. However, the package is never complete without proper thickness and to seal that deal, Airhead goes for a satisfying 8 inches. What is more impressive than the fact that this board can handle up to 1655 pounds is the build quality. Indeed, this board is one ferocious beast and that relies on the company’s manufacturing methods. Indeed, the strength of the Super SUP stems from its military grade PVC coat and an industrial drop stitch construction, making it one of the most serious contenders on the list. As far as features go, this Airhead has no tricks up its sleeves. Hence, the board comes with a gigantic anti-skid pad that will grant you the grip and control you need while riding in different circumstances. Also, the board comes with plenty of carry handles for easier transportation. However, do not think for a second that you can carry it on your own. Last but definitely not least, this board knows exactly what it is which is why it comes with four inflation valves and four high pressure hand pumps. SOLfiesta is a great board but it’ll definitely have to put on quite a show to slide from under Airhead’s shadow. Indeed, overcoming such competition must be tough but that hasn’t stopped this brand from making a spot for itself continuously. Hence, is the SOL the best large stand up paddle board on this list? You decide! First things first, the board at hand measures a promising 15 feet in length which is plenty of space for up to 5 passengers and that makes a party. However, without a balanced width ratio, you risk ending that party a lot earlier that is why this board comes at a staggering 5 feet 6 inches in width. Nevertheless, SOL could have done a little better on thickness as it comes in 6 inches whereas smaller boards offer a much more reliable 8 inches. Further, whether you’re planning a booze cruise, a friendship love ride or a family fun time, this board will definitely be up for it as it can handle up to 800 pounds at once. However, in order to achieve that strength, it was necessary to build this board the right way. Hence, the SOL is made out of industrial grade PVC which is then put together via a drop stitch heavy duty construction to perfectly seal any seam, giving us what could be the toughest iSUP in the world. In conclusion, there are many things, which distinguish the SOL from its competition, and design is one of them. Hence, the board at hand definitely looks like a raft and that requires a certain set of features to operate. Accordingly, the SOL comes with an abundance of carry handles to make sure the transportation process goes smoothly. Also, this board maintains the cargo net situation because it is so practical as it will secure your personal belongings under your eye wherever you go. Lastly, the SOL features 2 inflation valves and a 12 volt electric pump which will make inflating this tremendous paddle board a breeze.